Homesteading is not cheap. It can be done frugally, but at some point, you have to open up your wallet. You need equipment, feed, fencing, coops, hutches, and so on. However, you can minimize your costs or prevent future costs by being proactive. You can also make a little money homesteading if you wish. I want to help you save money and maybe make money homesteading. My goal in life is to save money and help others do the same. We can always try to save money! Below is eighteen suggestions that can help you to save and possibly make money homesteading! 1. Shop around. Your local feed store may be great for convenience, but sometimes you can find feed and supplies cheaper at the co-op or another store. For five miles, feed and supplies might be cheaper in the next town. Shop around and save some pennies. 2. Scout out the junk piles at family and friends' homes. They might have some things to get rid of that will suit you perfectly. That is how I ended up with materials for my chicken coop and outdoor area. 3. Ask for materials. Craigslist and Facebook garage sale sites are great places to look for materials and equipment. If you are looking for something and can't find it, just post that you are in search of (ISO) of something. More than likely, someone has that item and can part with it. 4. Attend farm sales and auctions. I love auctions! I have walked away with a great many things that were pennies on the dollar cost-wise. Look over everything carefully when you get there, set a dollar amount in your mind for what you want, and bid wisely. Many times I have gone to auctions where family and friends feel bad for the family having the farm auction and bid things up with no interest in buying them just to make the family more money. Watch that you don't get caught up in a bidding war. 5. Graciously accept donations from family and friends. I have my own junk pile due to generous offerings from family and friends. I took a dog kennel when I had no idea what to do with it. It became the outdoor area for the chickens when they couldn't be out in the yard. 6. Be creative in using materials. Not everything needs to be exactly like the plan. The internet is full of ideas on re-purposing materials and making your own things. I have also found many books at the thrift shop that has helped me save money and re-purpose materials. 7. Sell the items you don't need anymore. I have bought a few things that I thought would be great for my homestead. It turns out I was wrong or the items weren't a good fit. You can sell those things and use that money for your next homesteading purchase. 8. Do the work yourself. This should go without saying, but a lot of people hire out a lot of work that can be done by them. I am not perfect in this area either as I have the garden tilled by someone else every year. However, I (or the kids) mow the lawn ourselves. We do most of our own repairs. We haul most of our own materials unless the materials are just too big for the vehicle. 9. Don't be afraid to accept help or advice when it is given freely. Most offers of help and advice are given generously and can often be repaid in kind whether it be homemade jams/jellies or a home-cooked dinner. 10. Use what you produce. Plan meals around all those eggs. Eat from the garden when the garden is producing. Preserve the bounty. You get it - stop going to the grocery store and eat what you have. 11. Animal manure is a commodity - sell it or barter with it. People want it so you should use that to your advantage. I often have a lot more than I need of the animal by-product. Other people who have gardens or cannot raise animals will often take this off your hands. 12. Sell the extra eggs and produce. By no means am I saying to take food away from your family, but if you have way more eggs and produce than your family will ever eat, sell the extras. A little income here and there will help pay for other homesteading projects! If you want to take this a step further, expand the garden and sell at the local farmers' market. 13. Ask to glean. If you know your tomatoes are not producing and a friends' tomatoes are going to waste, ask if you can have them. Picking produce after the owner has picked his fill is called gleaning. Offer to pay or trade, but most of the time you will get them for free. This has worked for me for years! 14. Use your free labor. If you have kids or grandkids, you have free labor. Have them help you outside with your projects. Turn it into a teaching moment, teach them what you are doing, and why you are doing it. If kids understand the why, they will be more excited to help with the what. Also, you can always tell them it is a character building exercise - especially if they are "helping" you clean out the chicken coop. 15. Don't ignore the obvious. Look at everything growing on your homestead. Everything should have a purpose. If you don't know the purpose, look it up. Can it be used as food, a remedy, a cure, or whatnot? Find out and figure how you can use it. 16. Knowledge is power. Always be learning. Learning and knowledge are free. With the vast amount of information that is free, you should always be learning. 17. Take care of your things. Keep the tools free of rust, maintain equipment, change oil, make repairs quickly, and you will save money by not having costly repairs and having to buy new things to replace uncared-for things. 18. Wear gloves. Trust me on this. You will save your hands from blisters, broken nails, infected cuts, splinters, and other things that could cost you some inconvenience or a trip to the doctor is bad enough. Gloves are just prevention and finding a good fitting pair can take work. However, gloves are worth it and necessary. 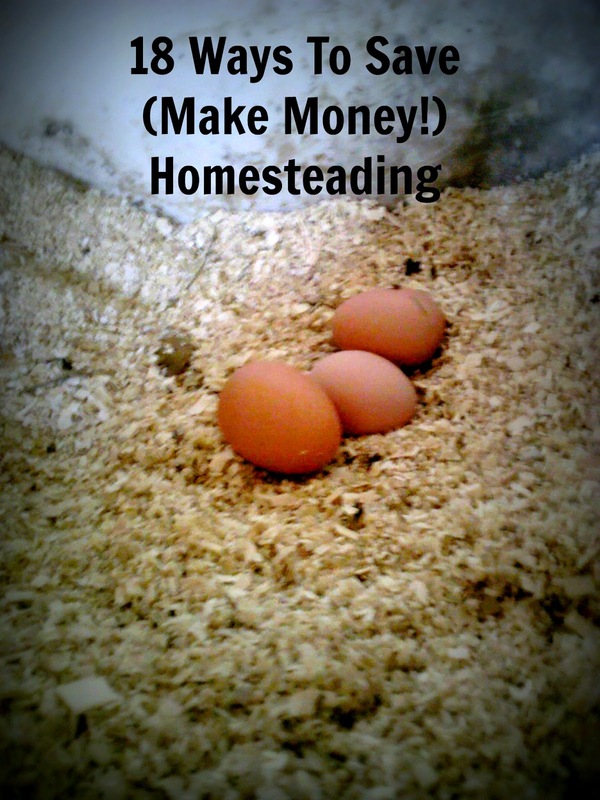 Do you have any more ideas or tips to save money homesteading? I would love to hear them!